I felt fortunate to be invited to this tasting because I have never had the opportunity to taste a vertical of Chianti’s like this going back 50 years! I have to admit that I can remember often drinking the Ruffno Riserva Ducale Oro in the early to mid-90’s, but haven’t tasted the wine since, so I thought that this was an incredible opportunity to see what I have been missing and to see how their wines age. 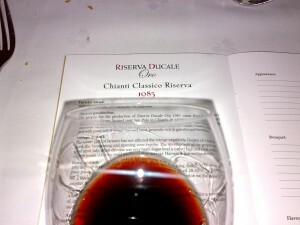 I also have to admit that I didn’t expect much from a 50 year-old+ Chianti. I was expecting a very light-colored, way past it’s prime Chianti. 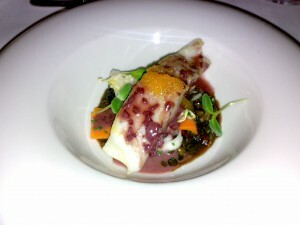 Read on to find how the Chianti’s were holding up and what they were paired with! First, a bit of history (from the brochure given to us in the beginning of the event): Back in 1890, Italy’s Duke of Aosta, who regularly passed through Tuscany on his travels to Rome, was so impressed with Ruffino wines that he issued a “Ducal certificate” naming the winery as the preferred supplier to his court. 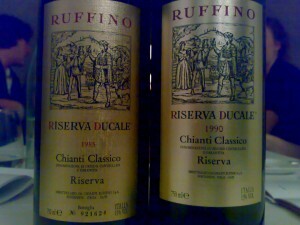 Ruffino crafted well-structured red wines specifically for the Duke’s demanding palate (the “Duke’s Reserve”), which became the inspiration for the wine’s orginal name when released in 1927: Riserva Ducale Chianti Stravecchio. 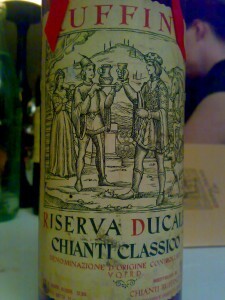 Riserva Ducale is the only Italian wine that is allowed to include the word “Riserva” in its name, because the name existed long before the production rules of Chianti Classico and Chianti Classico Riserva. Meticulous selection of the finest Sangiovese grapes, and ever more stringent quality controls led naturally to the creation of Riserva Ducale Oro. 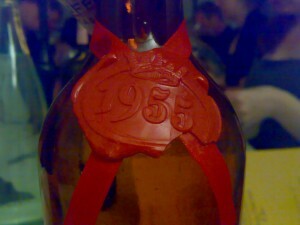 The wine was first produced in 1947. Made only in outstanding vintages, Riserva Ducale Oro is a true expression of the heart of Tuscan wine. Fermentation: The alcohol fermentation, aided by racking and punching down, took place in thermo-controlled stainless-steel vats at an average temperature of 28° Celsius for 10 days, and was followed by a post-fermentation maceration on the skins for another 8 days. 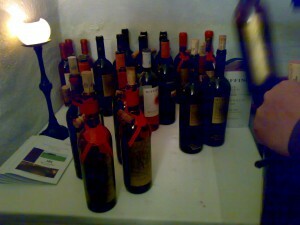 Aging: After completing the malo-lactic fermentation, the wine was aged first in vats for about 3 months, then in 35/75 hl. oak casks for about 24 months and, lastly, for a minimum of 3 months in the bottle. Palate: The Cabernet Sauvignon was also in the mouth – blackberries and peppers with gripping tannins from both the fruit and the oak. A modern Chianti with great structure, medium plus acidity and lot’s of oak. Needs some time for the oak to integrate. Extremely well-made. Fermentation: The alcohol fermentation, aided by racking and punching down, took place in thermo-controlled stainless-steel vats at an average temperature of 28° Celsius for 10 days, and was followed by a post-fermentative maceration on the skins for another 8 days. Nose: Mature cherries, cigar box, oak still dominant on the nose. Fermentation: The alcohol fermentation, aided by racking and punching down, took place in glass painted concrete tanks at a controlled temperature of 30° Celsius for 2 weeks, and was followed by a post-fermentation maceration on the skins for another 6 days. Appearance: Dark and still young looking as far as I could tell. Slightly brownish rim. 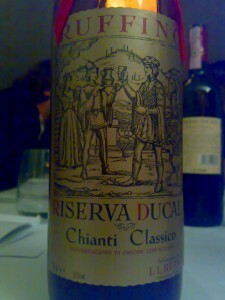 Nose: Very similar to the other Chianti’s, but no evident oak aromas. Plenty of farmyard aromas right off the bat with a bouquet of red and morell cherries. Fermentation: The alcohol fermentation, aided by racking and punching down, took place in glass painted concrete tanks at a controlled temperature of 28-32° Celsius for 2 weeks, and was followed by a post-fermentation maceration on the skins for another 8 days. Appearance: Dark and still young looking as far as I could tell. Slightly brownish rim. But, still surprisingly darkish. 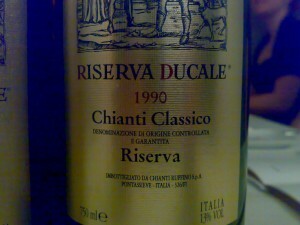 Nose: Farmyard, plums, cherries and some prunes suggesting that perhaps this Chianti was slightly past it’s prime. Fermentation: The alcohol fermentation, aided by racking and punching down, took place in glass painted concrete tanks at a controlled temperature of 28-32° Celsius for 2 weeks, and was followed by a post-fermentation maceration on the skins for another 15 days. Appearance: Showing age, especially around the edges with some browning, but still quite a deep and concentrated red color. Appearance: Still surprisingly deep and concentrated in color. 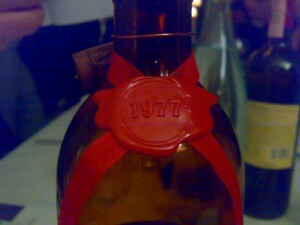 Even darker than the 1977! Brownish rim. As I mentioned, the lighting in the restaurant was mostly by candle-light and therefore it was hard to assess the color. 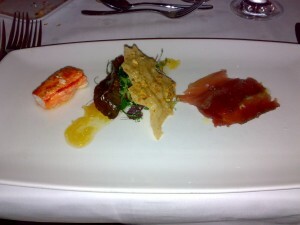 Palate: Great concentration and acidity. Still had firm tannins. Still had great structure. 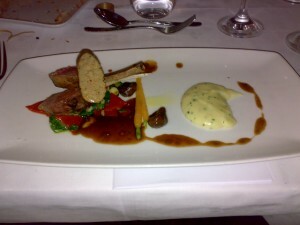 But, this wine had Madeira-like aromas and oxidation. Overall, it still had great mouth feel, acidity, structure and tannins, but the fruit didn’t match the rest of the components. 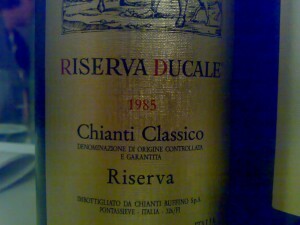 I have never tasted a Chianti of this age, but I am quite sure that this wine was past it’s prime. This really reminded me of some of the great old Boal Madeira’s I have tasted, but drier. A very interesting wine. It sparked many discussions around me at the table. We all enjoyed sipping it and many felt that it was perfect. Although I also thought it was a “perfect” bottle of 50 year-old Chianti, I still debated that the fruit was showing too much age and was at it’s peak years ago. Drink now. Overall, I was impressed with the quality of the wine-making in the Riserva Ducale Oro and am quite confident that the latest vintage(s) will age well.